Flexible and Customizable Dungeon Crawl. Gm'd this in High Tier. Very fun dungeon crawl making good use of the Bigger Caverns flip-mat. What I like most about this is the ability to customize and flex a little bit of creative control over a Society Scenario. I believe that you get the most out of this if you go through the differing monsters yourself and pick out the ones you want. Although story light, I was able to create a cohesive theme by go through the tables myself as opposed to rolling and I think my players really appreciated it. I have run and played this now several times. Overall I think it is a good addition to the evergreen stable. It is similar to Tome but with a variation on the starting investigation portion which can soak up too much time unless you keep the players well on track. It is easy for them to want to go off exploring all the leads when it is just an excuse to get them to the actual adventure portion. The different paths you can take are varied, with a good mix of different types of opposition. While you can pick randomly I strongly suggest not doing that and choosing something more suitable for your group instead. It is significantly less spikey than Tome (which has some very over tuned encounters) but can still offer plenty of challenge. This is a very randomized module. It can be great, okay, or awful. After playing through this, I purchased it. It's 91 pages long. For a 4 hour time slot, 91 pages. Except, here's the trick: you only use about 12 pages. Not only are there multiple maps to choose from, but there are also 3 major story lines with little extra variations, and a slew of monster encounters that are (usually) randomly rolled for and then arranged in a dungeon by a GM. So you winnow it down to just the few things you select, and use only that. This can be overwhelming, if you try to have all 91 pages ready to go! A GM would really, truly do well to pre-select some random arrangements, and then get very familiar with that pre-selected setup. If you try to learn all 91 pages and monsters and then pick them on the fly, it's going to be a nightmare. If you don't bother to learn any of it beforehand and then try to manage it all spontaneously as the random rolls dictate the encounters, it's going to be a sloppy mess. The map is, frankly, beautiful. At least, the "Bigger Cavern" map with the crystals on it is great to look at and to try to maneuver through. (There is a flip side to the Bigger Cavern product, and it's not as pretty, and it's used for 1 of the story lines here.) There are tight spaces, open spaces, water, the crystals, height changes, and so on. People can leap off ledges, swim, get bullrushed off of bridges (or bullrush the enemies! ), can get higher ground (+1 to melee attacks! ), and finally, as mentioned, there are fun challenges to deal with like the squeezing rules. There are little corners to hide in, too. It's a great map. GMs, please note. There is one spot on the map where narrow stairs take the PCs from elevation 0 to elevation 15' in just a single square. The PCs are going 15' up, but doing it by moving through just 1 square on the map (or at least mostly 1 square). This has gotta cost more than 5' of movement! What else can I tell you? Well, you are going to reconnect with some old friends/enemies in Kaer Maga, that's for sure. If you've played the older products (like The City of Strangers, part 1 & 2), then you'll be familiar with many areas here. If not, you can hope you get a GM who is in love with this giant city on a cliff, and hope he/she introduces you to some of the interesting locales on the city. Final word: this is a trainwreck or a wonderful time, mostly depending upon how your GM assembles this product. It has great potential, and you could play and re-play this a handful of times before you felt like you had exhausted most of the variations and story details. And the gameplay is great, if done well. So look for a good GM and hope that he/she is well prepared! Like it's predecessor 3-7 evergreen, needs more GM instruction on encounter balance. While there are two tiers, still possible to have a APL barely over the line forced to play up. These groups may not be able to handle some of the most deadliest aspects of the Higher Tier. Random generated dungeons are nothing more than a dungeon crawl as plots are too disconnected. Keep that in mind then it delivers as a dungeon crawl. It is not fun to be in a APL 5.4, forced to high tier and have a GM spring the worst trap on you (11d6) then say sorry there is no 4 player adjustment for traps. The GM's need to know they are the 4 party adjustment in those situations. Huzzah! Back to Kaer Maga! I must admit that I am nervous about returning to Kaer Maga. I really hope a particular NPC doesn't make her way into this scenario. In planning this scenario, we specifically noted that said NPC should not appear here for reasons you're likely thinking. I am glad to hear it, especially considering the replayable nature of the scenario. Any word yet about what maps may be in this one? Echoing this. Want to make sure I have it when I (probably) run this. This scenario sounds like a lot of fun. I love Kaer Maga. I would also love to know what the map list includes as I already have it scheduled for a gameday about a week after its release. Yay! More Kaer Maga madness!!! Just one map for 'From the Tome of Righteous Repose' and just one map for 'Beyond the Halflight Path'? I am loving that trend! Same. Makes life very easy when it comes to prep and running the game. It's definitely nice when it can work out that way, and the Bigger Flip-Mat line has provided us with some fertile ground for this style of adventure. It's a trend we hope to continue, map opportunities willing. Awesome. In the meantime, hopefully some of the maps we need for other scenarios, that are currently discontinued, will see the light of day once more as Classics. EDIT: Looking forward to seeing this scenario in action. It seems that Twisted Caverns is meant to replace things like Darklands Flip Mat. What time do these things become clickable? Haven't had my copy drop either. I was going to ask when this will this be added to my downloads, but TOZ beat me to it. That seems to be about subscribers however we still cannot just purchase the scenario in the usual way. It's actually both. She said she was going to work on the issue about not being able to obtain the PDF normally when she came into work this morning, but the issues from yesterday had kept her well past her shift. So hopefully today it'll be resolved. I have had similar issues with non-subscription PDFs that I bought. It is not even limited to Paizo publications. This module was nothing but a ton of fun and I loved it. So far, by far, the best PFS Adventure I have had the pleasure to play. Enough RP to be engaging, but not so much to bog everyone down with exposition. The visual and story elements were more than enough to get the story going and give us a real feel for things. The troll soothsayer? Talk about reading entrails! We ran into a Golem, and oh my good gracious was that thing a hard fight. We had a mixed group of 1 4, 1 5, and 3 7's. It was incredibly fun and challenging. 10/10 this was my favorite adventure in PFS so far. Question about some text in the scenario. Page 28 and 29 it refers to the Shining Deep for Handout #4 and after the NPC Text. Is it supposed to mean Sparklegrim Passage or actually the Shining Deep? Kyle, take the red pill! Come to the GM thread on this topic! Yes, that is a typo. Ignore it. It is one of many bizarre and sometimes amusing typos in this fabulous build your own dungeon adventure. Created a new file of three chronicle sheets, one for each vault, for player use. Each sheet sorts treasure by story arc. Moved the existing chronicle sheet to the back of the file. Added DCs for saving throws to the sidebar about check DCs. Added clarification that GMs may select the ceiling height in each room to best fit the chosen encounters. the book to make it clearer which monsters appear at which subtier. 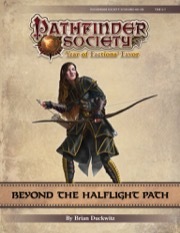 If you wish to download the updated version, you may do so for free at http://paizo.com/paizo/account/assets. The everything-on-one-sheet chronicle remains in the back of the scenario, and is still given to GMs. However, there are now three neatly-organized chronicles that can be given out to players. It's a very nice update! I haven't gone through explicitly to compare typos and the like, but what I saw looked fixed. The save DCs were there, for example.